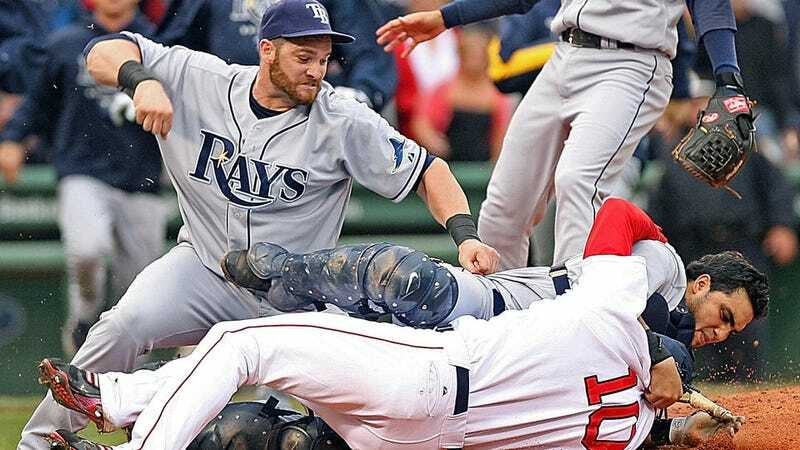 Jonny Gomes is going to be a big deal tomorrow. This is probably the first time that can be said about him on a National Stage, and that is probably unfair. At the same time, there is almost no reason why anyone outside of Tampa, Cincinnati, Oakland, Washington, or Boston would have any idea who he is. The most famous recent news about him is likely when he managed to injure a fan by punting a beer into the stands about a month ago. He once hit 3 home runs in a game as a rookie. He once hit 11 home runs in a single April. He has been sent down, waived, traded and signed as a free agent. He's on the cusp of being called a journeyman, but he's not too far removed from being a potential franchise player. It's tempting to say that Jonny Gomes makes no sense, but it's much more interesting to look at how he got to this point. The 2005 Tampa Bay Devil Rays were a generic bad team in the middle of a bunch of bad Tampa Bay baseball teams. The difference for this particular baseball Tampa team is that they had a little promise, in the form of Carl Crawford, Joey Gathright, and Jonny Gomes. This was supposed to be the outfield of the future for Tampa, carrying them away from the depths of the American League. Gomes was the power guy. Crawford and Gathright had speed in spades, enough to cover center and left with ease, Carl had already learned to hit for average, and Jonny was called up after hitting a home run every three games at AAA Durham at midseason. He went on to finish third in Rookie of the Year, smacking 21 home runs and a 140 OPS+ in just over a hundred games with the big club. Even with Gathright struggling, the Devil Rays were to be set in the corner outfield spots for years to come. It was not to be. We all know where Crawford's meteoric ascent took him, but Gomes struggled, bouncing above and below league average for a few years and finally leaving after playing one year as a Tampa Bay Ray. Gomes bounced around from there. A visit to Cincinnati resulted in his first trip to the postseason, though striking out thrice in six at bats without a hit put a damper on that. From there, it was on to Washington in a deadline deal to try to open a spot in the Reds lineup for their next big thing, Yonder Alonso. He was a bat for hire who didn't hit well enough to sustain that title. He was lucky to still be in the big leagues. A trip to Oakland was revitalizing. As a low cost pickup under platoon heavy manager Bob Melvin, Gomes resumed hitting like he had his rookie year in Tampa. A 142 OPS+ with 18 home runs in 99 games was a rejuvenation rewarded with his second trip to the playoffs, though this time he only managed one pinch hit appearance as the A's went home early at the hands of the Tigers. The solid season was rewarded with a 2 year, $10 million deal with the Red Sox, which brings us to exactly where we are right now. The differences in Gomes's third playoff trip are that he actually has a hit and his team has made it out of the Divisional Series, and that has set the stage for Game 4 in St. Louis. While Gomes hasn't been good in these playoffs, the Red Sox have kept winning, and he managed to turn the tide on one meatball from Seth Maness. He propelled that ball over the deep left field wall in St. Louis to give the Red Sox a 4-1 lead they would not relinquish, and for that he will be on the cover of every sports section in America tomorrow. Jonny Gomes never did realize his early potential, and he never turned into the bust that it appeared he might after Cincinnati. He has carved out a solid career, and he finally has a moment for the whole nation to appreciate. Good for him. Author's Note: I was researching Gomes before the sixth inning tonight. I'm not going to say I had an inkling (I will swear to forever I did) but something about Mr. Gomes was fascinating me tonight. I did make some key edits as the game progressed.